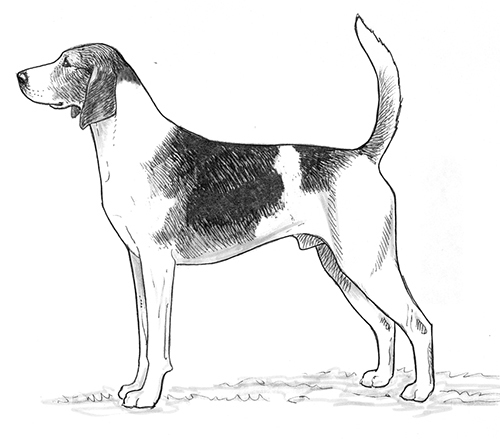 Developed in France, most likely beginning during the 16th Century, the Anglo Francais de Petite Venerie was created by crossing English hounds with the French hounds. It was used as a scenthound for hunting small game. 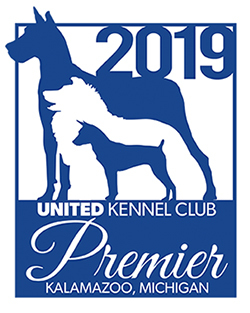 The Anglo Francais de Petite Venerie was recognized by the United Kennel Club January 1, 1996. A medium sized, well balanced and solidly built hound, with no trace of coarseness. In outline, his profile must appear to be that of a classic French hound. The head is fairly long, and not too broad. The skull is slightly convex, but not domed. There is no prominence of occiput. The stop is very slight. The muzzle is moderately long, and just a little pointed. The nasal bridge is straight or slightly arched. The upper lips cover the lower lips. The Anglo Francais de Petite Venerie has a complete set of evenly spaced, white teeth meeting in a scissors bite. The nostrils are well opened, and the nose is fully pigmented. In the white and black dogs, the nose is black. In the white and orange dogs, the nose is brown. The eyes are large and brown, with a soft, intelligent expression. Faults: Light or prominent eyes. The ears are finely attached below the level of the eye. They are flexible, slightly turned, and of medium width. They reach almost to the border of the nose. Faults: High set, broad or short ears. The shoulder blades are long, flat, and sloping. The chest is well developed, and let down at least to the level of the elbow. The ribs are long and moderately rounded. The back is firm and straight. The loin is quite short and muscular, and the croup is fairly long and slightly sloping. There is a slight tuck up. The thighs are deep and muscular. The hocks are slightly bent, and close to the ground. The tail is set on as an extension of the spine. It is medium in length and quite fine. There is no brush. White and black, with bright or pale tan markings. Orange and white. Height at the withers is between 19 and 22 inches.